It was the best of times, it was the worst of times. The 2016 elections gave the Republican Party control of both houses Congress and the presidency-a level of dominance the party had experienced for only six years out of the previous eight decades. Combined with the GOP's victories in state legislatures and governorships since 2010, Republicans held a greater opportunity to reshape the nation than at any time since the 1920s. And yet, Republican strategists were painfully aware that the party had lost the popular vote in six of the previous seven presidential elections. The presidency had fallen to Donald Trump, a populist outsider who had mounted what was, in effect, a hostile takeover of the Republican establishment. The party's internal divisions had become so volatile that they had come close to blowing up the Republican National Convention in Cleveland that summer. The Republican-controlled Congress had experienced infighting so severe that the Speaker of the House, John Boehner, had been overthrown and his successor, Paul Ryan, had been plagued by an inability to pass consequential legislation. An unprecedented number of GOP officeholders, activists, and voters harbored dark suspicions that they had been betrayed by their own party leaders. And few had answers to the basic question: What does the Republican Party still stand for, anyway? 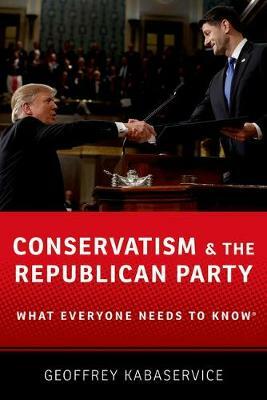 Geoffrey Kabaservice's Conservatism and the Republican Party: What Everyone Needs to Know will provide a narrative and analysis of the Republican Party's shambolic trajectory into triumph and chaos. It will revisit the theme of my previous book concerning the GOP's purge of moderates over the previous half-century and its transformation into an ideological party unlike any other in American history. But it will also track the emerging divisions within the conservative movement, tendencies toward extremism, growing hostility toward governing, and breakdown of the American political system - most vividly demonstrated by the Trump phenomenon.